Army Transport Service, 1949-present - Authority for the previous flag was rescinded by a War Department circular on January 14, 1947. A new flag, brick red with the Transportation Corps device in golden yellow, was prescribed on April 5, 1949. Army Transport Service, 1943-47 - After the Transportation Corps was established as a separate corps of the Army, a change to AR-260-10, published in 1943, replaced the Quartermaster Corps badge on the ATS flag with the badge of the Transportation Corps, in red. Army Transport Service, 1923-1943 - as above, without the lettering. Prescribed in the 1923 Army Regulation on flags, AR 260-10. Army Transport Service, circa 1917 - 2:3, divided diagonally red, white, and blue, with the Army Quartermaster Corps badge on the center, the letters USA (for United States Army) above the badge and TS (for Transportation Service) below. This flag is shown in the 1917 National Geographic flags article [gmc17]. This flag was designed and patented by William F. Costan of New York City, Patent number 30,976 granted 13 June 1899. According to the "Auburn (NY) Bulletin", Wednesday, 26 July 1899, Coston "assigned the patent to the Secretary of War for the nominal sum of $1. The assignment has been accepted on tbe part of the Government by Colonel Charles Bird, quartermaster in charge of the transport service." "The Times" of Waterville, N.Y. and "The Monroe County Mail" of Fairpoint, N.Y. on Thursday, 24 August 1899 reported "Among the patents issued by the United States government this year was one for an official flag, the first patent of the kind ever written in this country. The patentee is William F. Coston, and the flag is for use on government transports. The war department approved the design submitted by the patentee, and seven flags were purchased by the government during the war with Spain." "The following inscription was furnished by Mr. Coston:"
"'Opposite corners, the upper one the nearer to the staff, are right-angled triangles of red and blue respectively, and the remainder, a diagonal strip between the triangles, is white. In the white field is a wheel crossed by a sword and a key and surmounted by an eagle. Thirteen stars adorn the rim of the wheel, and the letters "U.S.A.T.S." encircle the design.'" "A full authorization to make the flag was issued by the war department in January, but the patent was not given until May 13 [this is an error; the patent was applied for on 17 May and granted on 13 June]. The flag was first hoisted on January 1, on hoard the transport 'Port Victor', now the ‘McClellan', Capt. William C, Brickley, master. The log of that day contains the following entry:"
"'Latitude 23 degrees 9 minutes north, longitude 68 degrees 39 minutes west. To-day at noon all hands called to quarters, and the first flag of the transport service was hoisted on the main with all honors.'" These two newspapers also provided an illustration of this flag with the statement "ARMY TRANSPORT FLAG (The Only Ensign on Which a Patent Has Ever Been Granted.)" US Army Transport flag, WWI make and use. 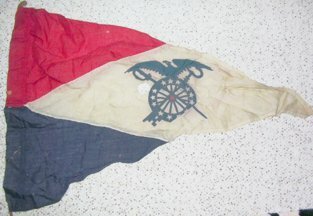 This was used as a pennant by small ships of the US Army Transport Service (ATS) and Harbor Boat Service (HBS) as well as a guidon for Motor Transport Companies (see page 314, National Geographic October 1917). Three feet and two inches by two foot 4 inches (or so). According to the "Auburn (NY) Bulletin", Wednesday, 26 July 1899, Coston "assigned the patent to the Secretary of War for the nominal sum of $1. The assignment has been accepted on the part of the Government by Colonel Charles Bird, quartermaster in charge of the transport service." "Opposite corners, the upper one the nearer to the staff, are right-angled triangles of red and blue respectively, and the remainder, a diagonal strip between the triangles, is white. In the white field is a wheel crossed by a sword and a key and surmounted by an eagle. Thirteen stars adorn the rim of the wheel, and the letters “U.S.A.T.S." encircle the design."